It was shown that the proteasome inhibitor, bortezomib, administered immediately following allogeneic bone marrow transplantation resulted in marked inhibition of acute graft-versus-host disease (aGVHD), with retention of graft-versus-tumor effects. However, continuous bortezomib administration resulted in significant acceleration of graft-versus-host disease–dependent morbidity. We carried out studies to dissect the mechanisms of aggravated aGVHD caused by delayed bortezomib administration. First, we demonstrated that IL-1β was critically involved, and the subsequent aGVHD could be alleviated by IL-1β blockade. Bortezomib treatment after dendritic cell (DC) activation resulted in drastically elevated IL-1β production, whereas bortezomib treatment before DC activation inhibited IL-1β production, suggesting that the timing of bortezomib administration significantly affected IL-1β production by DCs. We further demonstrated that delayed administration of bortezomib accelerated aGVHD through TLR4 signaling. Because the LPS levels were much lower with reduced-intensity conditioning compared with high-dose irradiation, the accelerated graft-versus-host disease–dependent morbidity with delayed bortezomib administration could be rescued by reduced-intensity conditioning. Our studies suggested that TLR4 pathway activation and delayed bortezomib administration amplified the production of IL-1β and other inflammatory cytokines, which resulted in accelerated aGVHD-dependent morbidity. These results indicated that decreased toxicity of continuous bortezomib administration could be achieved by reduced-intensity conditioning or by inhibiting IL-1β. Allogeneic hematopoietic stem cell transplantation (allo-HSCT) is an intense and curative therapy for patients with hematologic malignancies. However, the incidence of graft-versus-host disease (GVHD) significantly limits the applicability of allo-HSCT (1). The progression of GVHD is characterized by the secretion of proinflammatory cytokines (e.g., IL-1β, TNF-α, IFN-γ, IL-6) (2) by alloactivated donor T cells and other effector cells. These cytokines perpetuate GVHD through direct cytotoxic effects on host tissues by activation and/or priming of immune effector populations. Some reports (3, 4) showed that neutralization of cytokines, such as IL-1β or TNF-α, can attenuate GVHD-related mortality. The transcription factor NF-κB was shown to play an important role in regulating cytokine production and cell-mediated immune responses (5). The activation of NF-κB can increase the transcripts of many cytokines, including IL-6, IL-12, and IL-1β. The processing of cytoplasmic pro–IL-1β is dependent on the inflammasome system (6). Interestingly, inhibition of NF-κB leads to enhanced processing of pro–IL-1β, despite the inhibition of NF-κB–dependent gene expression (7). Therefore, NF-κB plays opposite roles in pro–IL-1β expression and processing. Bortezomib is a dipeptidylboronic acid analog and reversible proteasome inhibitor that was approved for the treatment of patients with relapsed multiple myeloma by predominantly inhibiting NF-κB (8). Other investigators (9, 10) independently demonstrated that bortezomib administered immediately after allo-HSCT resulted in marked inhibition of acute GVHD (aGVHD) while preserving graft-versus-tumor responses. A phase I trial of bortezomib, tacrolimus, and methotrexate for GVHD prophylaxis after reduced-intensity conditioning allo-HSCT also indicated that bortezomib was a promising novel immunomodulatory agent in allogeneic transplantation (11). However, delayed administration of bortezomib exacerbated GVHD-dependent mortality due to severe gut pathology in a murine allo-HSCT model (9). This bortezomib-induced GVHD-dependent mortality was preventable by depletion of CD4+ T cells, and the improved survival correlated with reduced TNF-α levels (12). However, the detailed mechanism and the key players of this exacerbated GVHD caused by delayed bortezomib administration remain to be elucidated, but this is necessary for developing safe strategies to improve the therapeutic efficacy of bortezomib in GVHD prophylaxis. TLRs are involved in maintaining tolerance and eliminating pathogenic microorganisms, but they also play a role in amplifying cellular responses that ultimately cause inflammation (13, 14). TLR signaling stimulated by pathogen associated molecular patterns was found to regulate immune responses during inflammatory diseases with similarities to GVHD, such as systemic lupus erythematosus (15), arthritis (16), and inflammatory bowel disease (17). LPS, a structural component of Gram-negative bacteria, is a potent stimulator of TLR4 (18). The LPS–TLR4 pathway was demonstrated to play a crucial role in the pathophysiology of GVHD (13). TLR4 polymorphisms are also associated with a higher incidence of GVHD in hematopoietic stem cell transplantation (HSCT) recipients (19). NF-κB can be activated by the canonical pathway triggered by TLRs and proinflammatory signals. The expression of NF-κB–dependent genes, including inflammatory cytokines, may amplify the inflammatory responses during GVHD. The current results demonstrated that IL-1β and the LPS-TLR4 pathway played critical roles in exacerbated GVHD-related mortality by delayed administration of bortezomib. Out data suggested that reduced-intensity conditioning (RIC) with low levels of LPS, inhibition of TLR4 signal, or IL-1β blockade could significantly prevent the accelerated GVHD-related death caused by delayed bortezomib administration after allo-HSCT. C57BL/6 (H-2b) and BALB/c (H-2d) mice were purchased from the Shanghai Laboratory Animal Center, Chinese Academy of Sciences (Shanghai, China). C57BL/6 (H-2b) TLR4-deficient mice were purchased from the Model Animal Research Center of Nanjing University (Nangjing, China). Mice were kept in a specific pathogen–free facility in microisolator cages, and experiments were performed when the mice were between 7 and 9 wk of age. All animal protocols were approved by the Institutional Laboratory Animal Care and Use Committee of Soochow University. Cell culture medium was RPMI 1640 supplemented with 10% FBS, 100 U/ml penicillin/streptomycin, 2 mM l-glutamine, 10 mM HEPES [N-2-hydroxyethylpiperazine-N-2-ethanesulfonic acid], 1 mM nonessential amino acids, 1 mM sodium pyruvate, and 2.5 × 10−5 M 2-ME (all from Life Technologies/Invitrogen, Carlsbad, CA). Bortezomib (VELCADE) was obtained from Millennium Pharmaceuticals (Cambridge, MA). Stock bortezomib solution (1 mg/ml) was prepared in Dulbecco PBS solution and stored at −80°C for up to 2 mo before use. Murine rGM-CSF was purchased from Hangzhou Clongene Biotech (Hangzhou, China). Mouse IL-1β, IFN-γ, and TNF-α ELISA kits were purchased from Dakewe Biotech (Beijing, China). LPS was obtained from Sigma-Aldrich (St. Louis, MO). Rabbit polyclonal Ab to TNFRI was purchased from Abcam (Cambridge, MA). FITC-conjugated anti-CD80 (16-10A1), FITC-conjugated CD86 (GL-1), PE-conjugated anti–I-Ab (AF6-120.1), and PerCP-Cy5.5–conjugated anti-CD11c (N418) were purchased from BioLegend (San Diego, CA). Myeloablative conditioning consisted of 8.5-Gy total-body irradiation (TBI) administered on day −1 in a single dose using a medical computerized linear accelerator (Siemens, Munich, Germany). Recipient mice were conditioned with RIC consisting of 200 mg/kg/d fludarabine (Zhejiang Hisun Pharmaceutical, Zhejiang, China) injected i.p. on days −8 to −4, 60 mg/kg/d cyclophosphamide (Jinan Bangda Chemical, Jinan, China) injected i.p. on days −3 and −2, and 4-Gy TBI on day −1 (20). Conditioned recipients received a single i.v. injection in the lateral tail vein of donor bone marrow (BM) cells (10 × 106) and spleen cells (5 × 106). BM suspensions were prepared by gently releasing cells from the backbones, femurs, and tibiae into PBS with a mortar and pestle and filtering through sterile mesh filters to remove particulates and obtain single-cell suspensions. Spleen-cell preparations were prepared by gently crushing the tissues with glass to release the cells. Preparations were filtered to remove debris and washed twice in PBS for injection. Cell counts were performed on a Coulter Z1 cell counter (Beckman Coulter, Brea, CA). Responder T cells were obtained from spleen cells from BALB/c mice (H2d). Stimulators were BM progenitor–derived dendritic cells (DCs) from C57BL/6 mice (H2b). BM progenitor–derived DCs from C57BL/6 mice were generated and expanded in 10 ng/ml GM-CSF (R&D Systems, Minneapolis, MN). After 7 d of culture, DC phenotypes were confirmed by CD11c staining (BD Biosciences, Franklin Lakes, NJ); the purity was >90%. DCs were divided into four treatment groups: adding different concentrations of bortezomib at 6 h after LPS treatment (100 ng/ml), adding different concentrations of bortezomib at 6 h before LPS treatment (100 ng/ml), LPS treatment only (100 ng/ml), and bortezomib treatment only. Twenty-four hours later, cytokines secreted in the culture supernatants were determined by ELISA, and the remaining cells were stained with CD80, CD86, and I-Ab (all from BioLegend) for assessing the phenotypes of DCs by flow cytometry. DCs treated as above were irradiated (30 Gy) and then cultured with allogeneic splenocytes from BALB/c mice for 3 d in U-bottom microwell plates at 37°C. Responder cells were pulsed with tritiated thymidine (1 μCi/well) (Shanghai Institute of Physics, Chinese Academy of Sciences) 16–18 h prior to harvesting and were counted on a β-plate reader (PerkinElmer Instruments, Meriden, CT). Four individual wells were analyzed per data point. Representative samples of liver, gut, skin, and lung were obtained at the time of GVHD-related death or at the time of sacrifice after transplantation, fixed in 10% formalin, and embedded in paraffin blocks. Five-micrometer-thick sections were stained with H&E using standard protocols. The sections were subjected to immunohistochemical staining using specific Ab to TNFRI (Abcam) for detecting protein expression in target tissues. Microscopic images were obtained using an Eclipse E1000M microscope (Nikon, Melville, NY) with a digital camera and acquisition software (Diagnostic Instruments, Sterling Heights, MI). Images were processed with Photoshop CS V8.0 (Adobe Systems, San Jose, CA), with standard adjustments of brightness, contrast, and color balance to the entire image. Assessment of tissue damage was performed based on scoring systems previously described (21). Briefly, the tissue damage was graded from 0 to 5 according to the following criteria: grade 0, normal structure of villi; grade 1, development of small subepithelial space at the villous apex; grade 2, enlarged subepithelial space but without change in villous length and width; grade 3, few shortened villi and presence of cells in the lumen; grade 4, the majority of villi are shortened and widened with crypt hyperplasia and cells in the lumen; and grade 5, blunting of all villi with elongated crypts and a large number of cells in the lumen. To evaluate the density of TNFRI+ cells, the tissue sections were examined using an Eclipse E1000M microscope (Nikon) at low power (×100), the five most representative fields were selected and analyzed at high power (×400). Positively stained cells were counted and expressed as the number of cells/field. The degree of systemic GVHD was assessed by a scoring system that sums changes in five clinical parameters: weight loss, posture (hunching), activity, fur texture, and skin integrity (maximum index, 10). Animals with severe clinical GVHD (score ≥ 6) were sacrificed according to institutional animal ethics requirements, and the day of death was deemed to be the following day (22). Culture supernatant from triplicate wells was obtained and assayed for IL-1β and TNF-α in standard ELISA assays. For in vivo experiments, animals were sacrificed, and their blood was clotted on ice for 10 min; serum was separated by centrifugation at 4°C and stored at −80°C for further analysis of cytokine levels. Serum levels were measured in duplicate wells using mouse IL-1β, IFN-γ, and TNF-α ELISA kits (Dakewe Biotech). All assays were performed according to the manufacturer’s protocol. For determination of endotoxin concentration in serum in the different conditioning models, Limulus amebocyte lysate (LAL) assays were performed according to the manufacturer’s protocol (Chinese Horseshoe Crab Reagent Manufactory, Xiamen, China). Briefly, serum samples were collected and analyzed using pyrogen-free materials, diluted 10% (v/v) in LAL reagent water, and heated to 70°C for 5 min to remove any nonspecific inhibition to the assay. Samples were incubated with equal volumes of LAL for 10 min at 37°C and developed with equal volumes of substrate solution for 6 min. The absorbance of the assay plate was read at 405 nm using a microplate reader (BioTek, Winooski, VT). Samples and standards were run in duplicate, and the detection limit was 0.15 U/ml. Kaplan–Meier survival curves were generated using GraphPad Prism 5 software for Windows (GraphPad, San Diego, CA). Statistical differences in animal survival were analyzed by the log-rank test. Serum cytokine levels were analyzed using the two-tailed Student t test. For all tests, p < 0.05 was considered statistically significant. Previous studies (9, 23) showed that immediate administration of bortezomib protected mice from aGVHD, whereas delayed administration of bortezomib led to accelerated aGVHD morbidity following allogeneic BM transplantation (BMT). We first analyzed the proinflammatory cytokine production after immediate and delayed bortezomib administration. Using a fully MHC-mismatched BMT model, we found that many proinflammatory cytokines, such as IL-1β, IFN-γ, and TNF-α, increased at 6 h after delayed administration of bortezomib (day 4 after BMT) during ongoing aGVHD (p < 0.05) compared with the early-administration group or the no-treatment control group (Fig. 1A). All mice died of aGVHD within the first day (24 h) of delayed bortezomib administration. These results are in agreement with the previous studies and indicated that, despite the ability of bortezomib to block NF-κB activity, delayed bortezomib administration increased the production of proinflammatory cytokines that were critical for the progression of aGVHD. 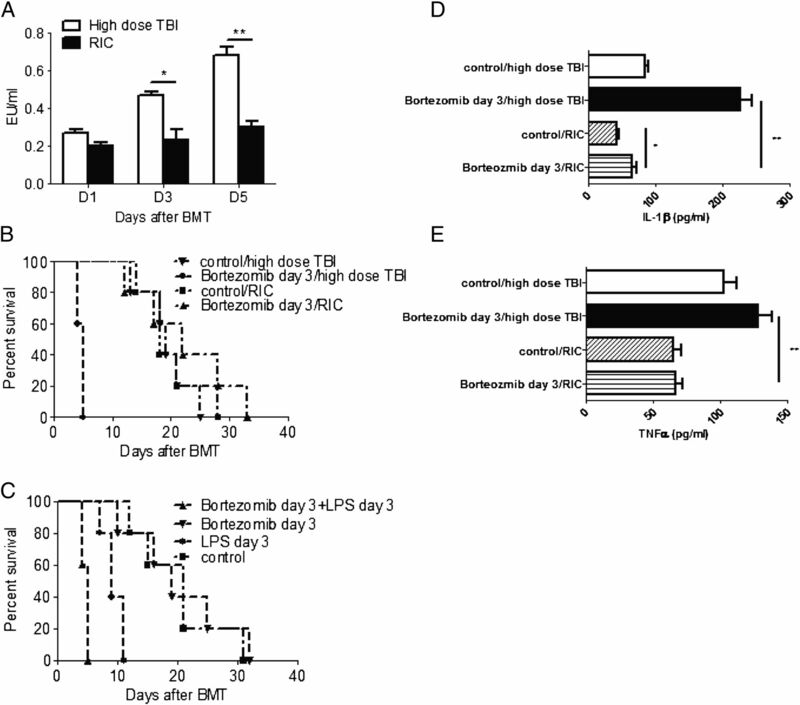 IL-1β blockade protects mice from lethal GVHD caused by delayed bortezomib administration. Lethally irradiated (8.5 Gy) BALB/c (H2d) recipients of 10 million BM cells and 5 million spleen cells from C57BL/6 (H2b) mice were treated or not with bortezomib (10 μg/d). Bortezomib was administered on days 0–2 or on day 3 after BMT. (A) Serum was collected at 6 h after day-3 bortezomib administration, and levels of IL-1β, IFN-γ, and TNF-α were measured. Significant increases in all three cytokines were observed in the group given delayed bortezomib. (B) The recipient mice were treated with either anakinra alone (6 mg/kg, twice daily from days 1 to 3) or anakinra plus day-3 bortezomib. The combined treatment significantly prolonged survival compared with day-3 bortezomib treatment alone (p < 0.001) and compared with anakinra treatment alone or no treatment (control) (p < 0.05). (C) The clinical scores over time in mice from the above groups show similar patterns. (D and E) Histopathology (H&E staining) and histologic scores of small intestine on day 4 from representative recipients from above groups (original magnification ×100). The results from one of three independent experiments are presented. Each experiment contained four to eight mice/treatment group. *p < 0.05, **p < 0.01, ***p < 0.001. It was shown that transfer of TNF−/− T cells could protect recipients from bortezomib-induced GVHD-dependent toxicity (12). How the delayed administration of bortezomib could affect TNF production remains to be determined. It was shown that IL-1β could modulate TNF-α–mediated inflammatory lung diseases (24). Moreover, IL-1β secretion was negatively regulated by NF-κB activity (7, 25). Therefore, IL-1β could be the cytokine affected directly by delayed bortezomib administration. To test this possibility, we used anakinra, an IL-1R antagonist that binds to IL-1R to inhibit IL-1β signaling (Fig. 1B). As shown before, immediate administration of bortezomib protected mice from lethal aGVHD, whereas delayed administration of bortezomib resulted in accelerated aGVHD-related morbidity (Fig 1B). Interestingly, mice treated with anakinra (6 mg/kg) twice daily from day 0 through day 2 post-BMT, together with delayed bortezomib administration on day 3, had significantly prolonged survival compared with mice treated with anakinra or bortezomib alone (Fig. 1B). Mice treated with anakinra only from day 0 through day 2 post BMT showed no improvement in survival, suggesting that anakinra treatment alone with the current dosing did not exert a beneficial effect on the progress of GVHD, other than preventing the deteriorating effects of delayed bortezomib administration. Histological examination of GVHD target organs on day 4 demonstrated a significant alleviation of pathological damage in the small intestines in the group treated with anakinra plus delayed bortezomib compared with the group receiving delayed bortezomib alone (Fig. 1D, 1E), indicating that blockade of IL-1β signaling markedly attenuated GVHD severity. Similar results were observed in the colon (data not shown). Consistent with the histopathology data, clinical scores decreased in the group receiving IL-1β blockade plus delayed bortezomib compared with the group receiving delayed bortezomib treatment alone (Fig. 1C). We further assessed the levels of the proinflammatory cytokines IFN-γ and TNF-α under the conditions of IL-1β blockade plus delayed bortezomib administration on days 4 and 8 post-BMT. On day 4 post-BMT, serum levels of IFN-γ and TNF-α were significantly (p < 0.05) lower in the group that received IL-1β blockade plus delayed bortezomib compared with the group that received delayed bortezomib alone (Fig. 2A). All of the mice that received delayed bortezomib died within 1–2 d after the treatment, whereas most of the mice that received combination treatment were still alive on day 8 post-BMT. Although the serum levels of IFN-γ and TNF-α in the combination treatment group were still higher than in the group given early bortezomib, they were significantly lower compared with mice that were given anakinra alone or received no treatment (control) (Fig. 2B). These results correlated with the survival data and suggested that combining IL-1β blockade and delayed bortezomib administration could greatly reduce the production of proinflammatory cytokines, as well as the severity of GVHD. Furthermore, IL-1β could be the key cytokine that was upregulated by delayed bortezomib administration, which was upstream of IFN-γ and TNF-α. 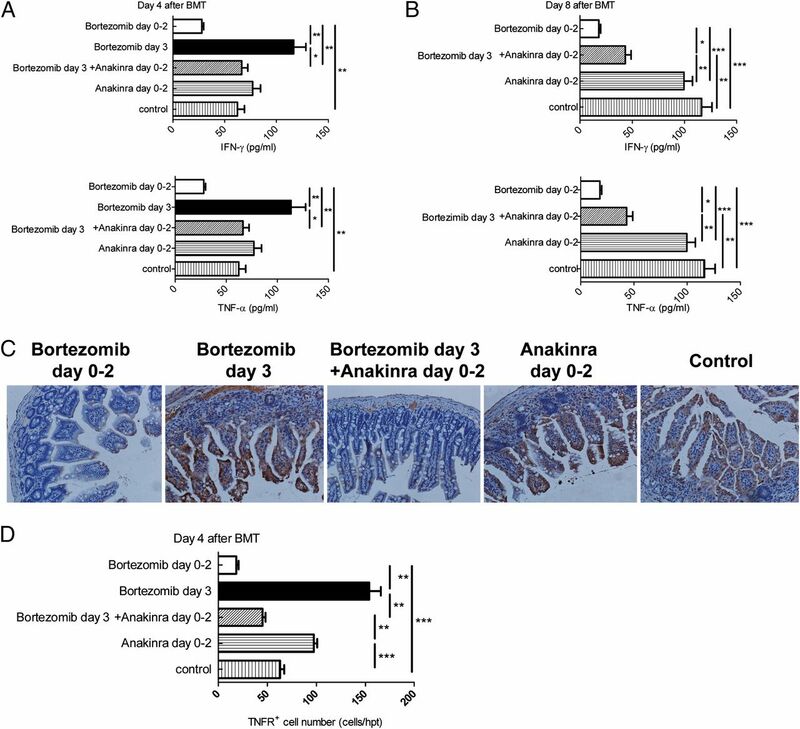 Immunohistochemistry revealed that delayed bortezomib administration increased TNFR expression in the small intestine (Fig. 2C, 2D). Combining IL-1β blockade and delayed bortezomib administration greatly reduced TNFR expression compared with delayed bortezomib administration alone, suggesting that IL-1β could increase both TNF-α and TNFR expression to upregulate TNF-α–mediated immune responses during delayed bortezomib administration. Combining IL-1β blockade and delayed bortezomib administration reduced the serum levels of IFN-γ and TNF-α compared with delayed bortezomib treatment alone. Lethally irradiated (8.5 Gy) BALB/c (H2d) recipients of 10 million BM cells and 5 million spleen cells from C57BL/6 (H2b) mice were treated or not with 10 μg bortezomib daily. Bortezomib was given on days 0–2 or on day 3 after BMT. The recipient mice also were treated with either anakinra (6 mg/kg) twice daily from days 1–3 alone or with anakinra plus day-3 bortezomib. Serum was collected on day 4 (A) and day 8 (B) post-BMT, and serum levels of IFN-γ and TNF-α were measured. On day 4 post-BMT, the combination treatment had significantly reduced the serum levels of IFN-γ and TNF-α compared with delayed bortezomib treatment alone. On day 8 post-BMT, the serum levels of IFN-γ and TNF-α of the combination group were also lower than those in the anakinra-alone group and the no-treatment control group. (C) Immunohistochemistry staining (rabbit polyclonal Ab to TNFRI) of TNFRI (original magnification ×100). (D) Numbers of TNFRI+ cells were analyzed. Results from one of three independent experiments are presented. Each experiment consists of four to eight mice/treatment group. *p < 0.05, **p < 0.01, ***p < 0.001. To understand the mechanism by which IL-1β could be differentially regulated by early and delayed bortezomib administration, we treated DCs with bortezomib (2–50 nM) before or after LPS (100 ng/ml) stimulation in vitro to mimic the situation of early and delayed bortezomib administration in vivo. Bortezomib alone downregulated the expression levels of CD80, CD86, and MHC II (Supplemental Fig. 1). However, bortezomib treatment before or after LPS stimulation did not affect the DC phenotypes. We also examined cytokine production by DCs. As shown in Fig. 3A, bortezomib alone without stimulation did not change the level of IL-1β production by DCs. However, bortezomib significantly reduced the production of IL-1β by DCs in a dose-dependent manner when they were treated with bortezomib before LPS stimulation (early administration). More interestingly, bortezomib treatment after DC stimulation (delayed administration) drastically increased the level of IL-1β production, also in a dose-dependent manner. TNF-α production by DCs was not directly affected by bortezomib treatment either before or after DC stimulation, with the exception that 50-nM bortezomib treatment before LPS stimulation significantly decreased the level of TNF-α production (Fig. 3B). Bortezomib treatment after DC stimulation drastically increased the production of IL-1β. In vitro BM-derived DCs from C57BL/6 mice were generated and expanded in the presence of GM-CSF and IL-4. After 7 d of culture, cells were treated with different concentrations of bortezomib 6 h before or after LPS treatment. LPS (100 ng/ml) treatment alone and bortezomib treatment alone were also performed as controls. After 24 h of incubation, IL-1β (A) and TNF-α (B) levels in the supernatants were detected by ELISA. (C) DCs prepared from C57BL/6 mice were treated as above and then irradiated and cultured with allogeneic splenocytes from BALB/c mice for 3 d. Tritiated thymidine was pulsed to detect the proliferation of allogeneic responder cells. A total of 1 μCi of [3H]thymidine was added to triplicate wells for the final 12 to 18 h before harvest. Proliferation was assessed using a liquid scintillation counter (Micromedics Systems, Huntsville, AL). Results from one of five independent experiments are presented. *p < 0.05, **p < 0.01, ***p < 0.001, versus LPS-alone control. To dissect the effect of differential regulation of IL-1β by bortezomib on alloreactivity, DCs with different treatments were used to stimulate allogeneic T cells (Fig. 3C). DCs treated with bortezomib alone or bortezomib treatment before LPS stimulation had reduced capacity to stimulate allogeneic T cell proliferation. However, DCs treated with bortezomib after LPS stimulation significantly promoted allogeneic T cell proliferation. The results suggested that early or delayed bortezomib treatment could suppress or promote allogeneic T cell activity through differential regulation of IL-1β production by DCs. Because DC stimulation by LPS was critical for the effect of delayed bortezomib administration in vitro, we used TLR4-deficient mice as recipients to further dissect the role of the LPS–TLR4 pathway in accelerated GVHD caused by delayed bortezomib administration. TLR4-deficient mice did not exhibit accelerated GVHD after delayed bortezomib administration and survived significantly longer than did the wild-type (WT) mice (Fig. 4A). TLR4-deficient mice with delayed bortezomib treatment even had slightly reduced GVHD-related mortality compared with WT and TLR4-deficient mice without bortezomib treatment, suggesting that delayed bortezomib administration exerted some beneficial effect on the GVHD-related survival in the absence of the TLR4 signal. These results demonstrated that TLR4 signaling played a crucial role in GVHD-related mortality caused by delayed bortezomib administration. Further studies showed that IL-1β (Fig. 4B) and TNF-α (Fig. 4C) levels in TLR4-knockout recipients with delayed bortezomib administration were significantly lower than in the WT mice with delayed bortezomib administration, suggesting that the TLR4 signals were critical for upregulating proinflammatory cytokines, especially IL-1β, during delayed bortezomib administration. TLR4 pathway contributes to accelerated GVHD-related mortality by delayed bortezomib administration. (A) TLR4-deficient or WT mice were used as recipients of allo-BMT, with or without delayed bortezomib administration (10-μg dose daily) on day 4 after BMT. Overall survival is depicted (n = 5–8 mice/group). Representative data from one of three independent experiments are presented. 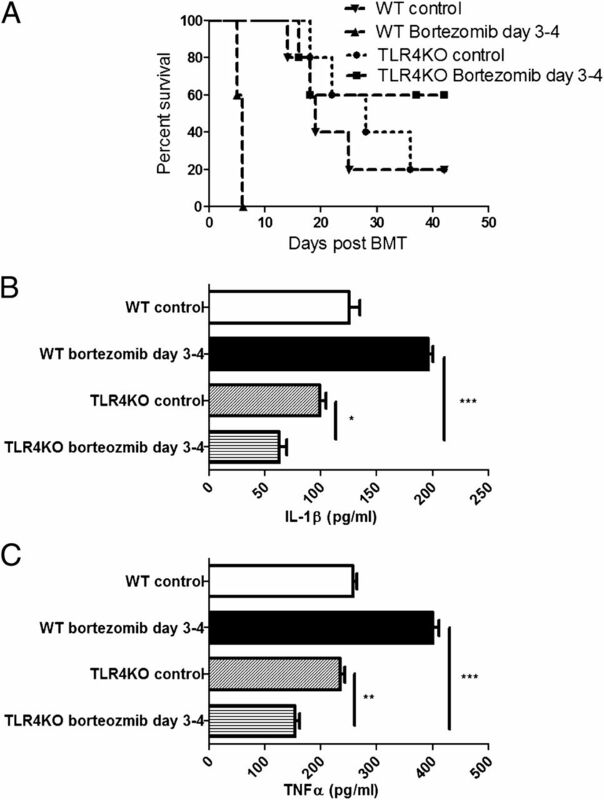 TLR4-deficient mice with delayed bortezomib administration survived significantly longer than did WT mice with delayed bortezomib administration (p = 0.003). Serum was collected on day 5, and serum levels of IL-1β (B) and TNF-α (C) were measured. Representative data from one of three independent experiments are presented. *p < 0.05, **p < 0.01, ***p < 0.001. Endotoxin (LPS) was shown to stimulate excessive inflammatory cytokine release from monocytes during GVHD (26). We next examined whether serum LPS levels were upregulated during BMT with different preconditioning regimens (Fig. 5A). Serum LPS levels increased significantly on days 1 through 5 post-BMT after high-dose TBI preconditioning. However, it remained at relatively low levels with RIC preconditioning that consisted of fludarabine, cyclophosphamide, and low-dose TBI. We next examined whether the GVHD-related mortality caused by delayed bortezomib administration could be reduced with RIC, which did not exhibit increased LPS serum levels (Fig. 5B). The GVHD-related survival patterns were similar with high-dose TBI conditioning or with RIC. However, as shown before, delayed bortezomib administration after BMT with high-dose TBI conditioning caused accelerated GVHD-related mortality (p = 0.003), whereas mice that had delayed bortezomib administration after BMT with RIC did not exhibit accelerated GVHD (p > 0.05). To further demonstrate the role of LPS in accelerated GVHD-related mortality, LPS (2 mg/kg) was injected i.p. right before the delayed bortezomib administration in the RIC BMT model (Fig. 5C). The mice that received LPS and delayed bortezomib administration died within 2 d (p = 0.003, versus control and bortezomib alone), whereas delayed bortezomib administration alone did not cause accelerated GVHD-related mortality in the RIC BMT model (p > 0.05). The recipient mice conditioned with RIC showed significantly lower IL-1β (Fig. 5D) and TNF-α (Fig. 5E) levels than did the mice conditioned with high-dose TBI after delayed bortezomib administration. These results demonstrated that LPS levels and TLR4 signals were important for increased IL-1β production and accelerated GVHD-related mortality caused by delayed bortezomib administration. (A) Endotoxin concentration in serum of mice from GVHD models with high-dose TBI conditioning or RIC were measured on days 1, 3, and 5 after BMT. Myeloablative conditioning consisted of TBI (8.5 Gy) administered on day −1 as a single dose. Host mice were conditioned with RIC consisting of 200 mg/kg/d of fludarabine injected i.p. on days −8 to −4, 60 mg/kg/d of cyclophosphamide injected i.p. on days −3 to −2, and 4 Gy of TBI on day −1 (n = 5–8 mice/group). Representative data from one of three independent experiments are presented. (B) The survival rate is depicted in two preconditioning GVHD models after delayed bortezomib administration on day 3 post-BMT (n = 5–8 mice/group). Representative data from one of four independent experiments are presented. The delayed bortezomib administration with RIC resulted in significantly prolonged survival compared with TBI conditioning (p = 0.003). (C) The level of LPS was elevated by i.p. injection of 2 mg/kg LPS on day 3 post-BMT together with delayed bortezomib administration in the RIC model. LPS injection alone, bortezomib administration alone, and no treatment with RIC were also assessed; the survival rates are depicted (n = 6–8 mice/group). Representative data from one of three independent experiments are presented. LPS injection together with delayed bortezomib administration significantly increased GVHD-related mortality compared with bortezomib administration alone (p = 0.003). Serum was collected on day 4 in two preconditioning GVHD models after delayed bortezomib administration on day 3 post-BMT. Serum levels of IL-1β (D) and TNF-α (E) were measured (n = 5–8 mice/group). Representative data from one of three independent experiments are presented. *p < 0.05, **p < 0.01. One of the major findings of this study was that IL-1β and TLR4 signaling were critically involved in the accelerated GVHD-related morbidity caused by delayed bortezomib administration after allo-HSCT. This lethal exacerbation of GVHD by continuous administration of bortezomib raised safety concerns about using bortezomib-based GVHD regimens, as well as limited the ability of this drug to sensitize tumor cells to immune-mediated killing to exert graft-versus-tumor effects (27). We demonstrated that blocking IL-1β or TLR4 signaling could completely eliminate the accelerated GVHD-related morbidity caused by delayed bortezomib administration. Because of the lower LPS levels and TLR4 activation, the lethal exacerbation of GVHD was also minimized in RIC allo-HSCT. A recent study (28) showed that a short-course (days +1, +4, and +7 post-HSCT) bortezomib-based GVHD regimen abrogated the survival impairment of HLA-mismatched unrelated donor RIC HSCT and enhanced early immune reconstitution, which demonstrated the safety of continuous bortezomib administration in RIC HSCT. Our studies provide a mechanistic understanding and strategies to prolong a bortezomib-based GVHD regimen. Many proinflammatory cytokines, such as TNF-α, IL-1β, and IFN-γ, increased after delayed administration of bortezomib during ongoing GVHD (Fig. 1A). It was shown that these proinflammatory cytokines were critical to the progression of GVHD (29). TNF-α plays a major role in the amplification and propagation of the “cytokine storm” for the initiation of aGVHD (30–32). The gastrointestinal (GI) tract is particularly susceptible to TNF-α produced by both donor and host cells, which directly causes tissue necrosis (33–37). Blocking TNF-α could decrease the toxicity and increase the efficacy of bortezomib in murine allo-HSCT. Sun et al. (9, 23) found that TNF-α production by CD4+ T cells and upregulation of TNFRI in gut tissues were the major mediators of bortezomib-mediated GVHD. They also demonstrated that the cytokine profiles and this TNF-α–mediated mechanism were the same in B6 and BALB/c hosts, suggesting a general regulatory mechanism across different BMT models. However, our data suggested that TNF-α may not be the major cytokine that is directly affected by the delayed bortezomib administration. IL-1β was shown to upregulate TNF-α production and TNFR surface expression in various cell types and organs (38–40). Our results suggested that IL-1β could be upstream of TNF-α and TNFR. Most importantly, IL-1β secretion is negatively regulated by NF-κB activity (7, 25). During the initial phase of GVHD, pro–IL-1β production is promoted, whereas its processing and secretion are inhibited by the activation of NF-κB through the inhibition of caspase-1 by NF-κB–dependent gene products. Reduced NF-κB activity caused by delayed bortezomib administration could dramatically increase the processing and secretion of the stored pro–IL-1β and result in a huge increase in IL-1β release. This could be the major initiator of the cytokine storm caused by delayed bortezomib administration. We demonstrated this possible mechanism in an in vitro system with cultured DCs (Fig. 3). TNF-α production did not exhibit differential patterns with early or delayed bortezomib administration, suggesting that IL-1β was the key cytokine directly affected by delayed bortezomib administration. Blockade of IL-1β signaling by IL-1Ra (anakinra) resulted in greater protection of GVHD target organs from pathological damage caused by delayed bortezomib administration (Fig. 1B). However, IL-1Ra treatment alone for 3 d did not exert any beneficial effects on the control group. One report (3) showed that IL-1Ra injections for 10 d after allo-HSCT prevented GVHD-related mortality. However, other studies (41, 42) suggested that IL-1Ra treatment alone was not sufficient to reduce GVHD. Despite that, the short-course treatment still prevented the aggravated lethal GVHD caused by delayed bortezomib treatment. Moreover, the combined treatment of IL-1β blockade and delayed bortezomib promoted survival compared with the control group, suggesting that delayed bortezomib could still play a beneficial role in treating GVHD when IL-1β signaling was blocked. Furthermore, the combined treatment did not completely prevent the occurrence of GVHD, which could be due to insufficient IL-1β blockade or the effects of other inflammatory cytokines. After allo-HSCT, the translocation of LPS and microorganisms from the bowel lumen through the damaged intestinal mucosa to the circulation can occur. Microbial products, such as LPS, that leak through a damaged intestinal mucosa or skin may stimulate the secretion of inflammatory cytokines through TLRs (14, 43–47). LPS was shown to stimulate excessive inflammatory cytokine release from monocytes during GVHD (26). Studies of inflammatory pathways involved in GVHD in animals showed that the GI tract plays a major role in the amplification of systemic disease. The GI tract is critical to the propagation of the “cytokine storm” that is characteristic of aGVHD (30). The role of TLR signals in GVHD has been controversial. It was shown that TLR signals can be dispensable for T cell alloresponses during GVHD (40). However, TLR polymorphisms could confer susceptibility to GVHD (2), and a recent study (48) showed that an endogenous TLR4 agonist could promote aGVHD after allo-HSCT. In our murine model, TLR4-deficient recipients exhibited slightly prolonged survival compared with the WT control group, but the difference was not statistically significant (Fig 4A). However, GVHD-related mortality caused by delayed bortezomib administration was significantly reduced in TLR4-deficient recipients. Our data may not be sufficient to demonstrate the role of TLR4 signals in GVHD, but they certainly suggested a critical role for TLR4 signals in the aggravated lethal GVHD caused by delayed bortezomib administration. We proposed that lower LPS levels and TLR4 activation may be the reason why the aggravated GVHD caused by delayed bortezomib administration could be eliminated in RIC allo-HSCT. The elevated serum levels of LPS were shown to correlate directly with histopathologic and biochemical parameters of intestinal injury occurring during both experimental and clinical GVHD (37, 49–52). TBI and allogeneic immune cells synergize to damage the GI tract, thereby permitting increased translocation of LPS into the systemic circulation. However, many regimens were involved in RIC, and we tested only one of them. Other drugs used in the RIC regimens could have different effects on the serum LPS levels. It is generally believed that RIC could cause less damage to the GI tract and induce lower LPS serum levels, which was also confirmed by our results. Nevertheless, different RIC regimens should be examined carefully, and the serum LPS levels could be used as an indicator of the safety of a bortezomib-based GVHD regimen. The results of this study demonstrated that IL-1β and TLR4 signals were critical for the exacerbation of GVHD-dependent pathology caused by delayed administration of bortezomib. The previous safety concerns about delayed bortezomib administration could be alleviated by IL-1β blockade and reduced LPS levels and TLR4 signals in RIC. A bortezomib-based GVHD regimen could potentially be used in combination with IL-1β blockade and RIC in T cell–replete allo-HSCT. We thank Dr. Kai Sun (The People’s Hospital of Henan, Henan, China) for critical review of the manuscript. This work was supported by grants from the National Natural Science Foundation of China (91029703, 81072436, and 81273268), project funding from Suzhou City (SS201032 and SZS201109), a project funded by Priority Academic Program Development of Jiangsu Higher Education Institutions, a Qing Lan project of Jiangsu Province, the Jiangsu Provincial Innovative Research Team, and the Program for Changjiang Scholars and Innovative Research Team in University (IRT1075).
. 2011. Effector CD4+ T cells, the cytokines they generate, and GVHD: something old and something new. Blood 117: 3268–3276.
. 2012. Toll-like receptor gene polymorphisms confer susceptibility to graft-versus-host disease in allogenic hematopoietic stem cell transplantation. Scand. J. Immunol. 76: 336–341.
. 1991. Inhibition of interleukin-1 by an interleukin-1 receptor antagonist prevents graft-versus-host disease. Blood 78: 1915–1918.
. 1992. Macrophage priming and lipopolysaccharide-triggered release of tumor necrosis factor alpha during graft-versus-host disease. J. Exp. Med. 175: 405–413.
. 2004. Inflammatory caspases: linking an intracellular innate immune system to autoinflammatory diseases. Cell 117: 561–574.
. 2007. NF-kappaB is a negative regulator of IL-1beta secretion as revealed by genetic and pharmacological inhibition of IKKbeta. Cell 130: 918–931.
. 2004. Proteasome inhibitor, bortezomib, potently inhibits the growth of adult T-cell leukemia cells both in vivo and in vitro. Leukemia 18: 1357–1363.
. 2005. 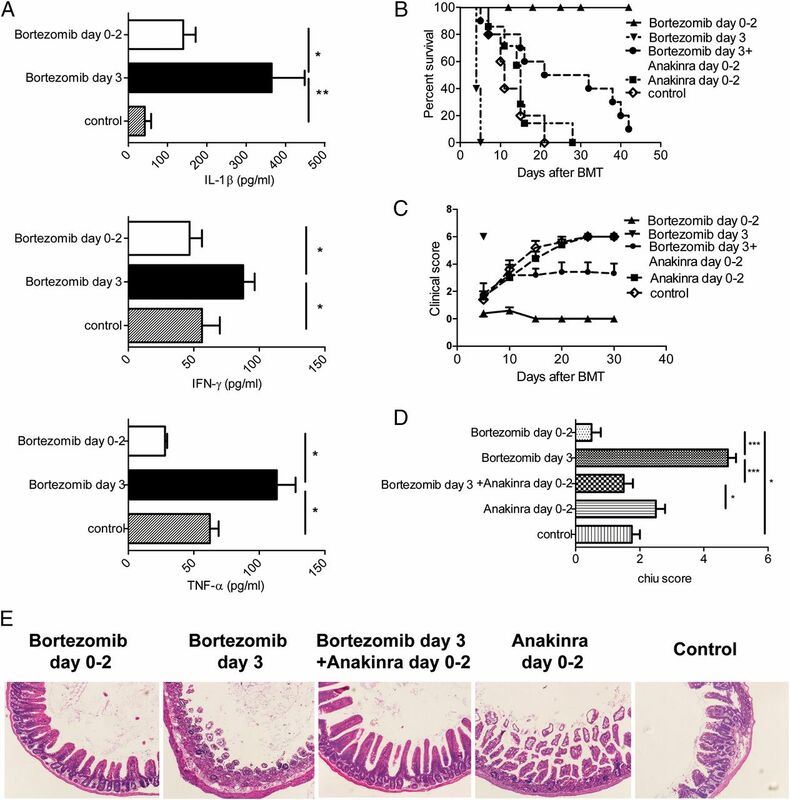 Differential effects of proteasome inhibition by bortezomib on murine acute graft-versus-host disease (GVHD): delayed administration of bortezomib results in increased GVHD-dependent gastrointestinal toxicity. Blood 106: 3293–3299.
. 2006. Bortezomib induces selective depletion of alloreactive T lymphocytes and decreases the production of Th1 cytokines. Blood 107: 3575–3583.
. 2009. Bortezomib, tacrolimus, and methotrexate for prophylaxis of graft-versus-host disease after reduced-intensity conditioning allogeneic stem cell transplantation from HLA-mismatched unrelated donors. Blood 114: 3956–3959.
. 2008. Differential effects of donor T-cell cytokines on outcome with continuous bortezomib administration after allogeneic bone marrow transplantation. Blood 112: 1522–1529.
. 2001. LPS antagonism reduces graft-versus-host disease and preserves graft-versus-leukemia activity after experimental bone marrow transplantation. J. Clin. Invest. 107: 1581–1589.
. 2004. Toll-like receptor control of the adaptive immune responses. Nat. Immunol. 5: 987–995.
. 2005. A stop codon polymorphism of Toll-like receptor 5 is associated with resistance to systemic lupus erythematosus. Proc. Natl. Acad. Sci. USA 102: 10593–10597.
. 2007. Inhibition of Toll-like receptor 4 breaks the inflammatory loop in autoimmune destructive arthritis. Arthritis Rheum. 56: 2957–2967.
. 2006. Toll-like receptor-1, -2, and -6 polymorphisms influence disease extension in inflammatory bowel diseases. Inflamm. Bowel Dis. 12: 1–8.
. 2012. Toll-like receptor activation of human cells by synthetic triacylated lipid A-like molecules. J. Biol. Chem. 287: 16121–16131.
. 2006. Mutations in innate immune system NOD2/CARD 15 and TLR-4 (Thr399Ile) genes influence the risk for severe acute graft-versus-host disease in patients who underwent an allogeneic transplantation. Transplantation 81: 247–254.
. 2008. Reduced intensity conditioning for allogeneic hematopoietic stem-cell transplant determines the kinetics of acute graft-versus-host disease. Transplantation 86: 968–976.
. 1970. Intestinal mucosal lesion in low-flow states. I. A morphological, hemodynamic, and metabolic reappraisal. Arch. Surg. 101: 478–483.
. 1998. Interleukin-11 promotes T cell polarization and prevents acute graft-versus-host disease after allogeneic bone marrow transplantation. J. Clin. Invest. 102: 115–123.
. 2004. Inhibition of acute graft-versus-host disease with retention of graft-versus-tumor effects by the proteasome inhibitor bortezomib. Proc. Natl. Acad. Sci. USA 101: 8120–8125.
. 2009. The effects of interleukin-1beta in tumor necrosis factor-alpha-induced acute pulmonary inflammation in mice. Mediators Inflamm. 2009: 958658.
. 2009. IL-1beta augments TNF-alpha-mediated inflammatory responses from lung epithelial cells. J. Interferon Cytokine Res. 29: 273–284.
. 2004. Probiotic effects on experimental graft-versus-host disease: let them eat yogurt. Blood 103: 4365–4367.
. 2003. The proteasome inhibitor PS-341 sensitizes neoplastic cells to TRAIL-mediated apoptosis by reducing levels of c-FLIP. Blood 102: 303–310.
. 2012. Bortezomib-based graft-versus-host disease prophylaxis in HLA-mismatched unrelated donor transplantation. J. Clin. Oncol. 30: 3202–3208.
. 2009. Graft-versus-host disease. Lancet 373: 1550–1561.
. 2000. The primacy of the gastrointestinal tract as a target organ of acute graft-versus-host disease: rationale for the use of cytokine shields in allogeneic bone marrow transplantation. Blood 95: 2754–2759. 2011. Implications of TNF-α in the pathogenesis and management of GVHD. Int. J. Hematol. 93: 571–577.
. 1990. Increased serum levels of tumor necrosis factor alpha precede major complications of bone marrow transplantation. Blood 75: 1011–1016.
. 2000. The p55 TNF-alpha receptor plays a critical role in T cell alloreactivity. J. Immunol. 164: 656–663.
. 2002. TNF-TNFR2 interactions are critical for the development of intestinal graft-versus-host disease in MHC class II-disparate (C57BL/6J→C57BL/6J × bm12)F1 mice. J. Immunol. 168: 3065–3071.
. 1987. Tumor necrosis factor/cachectin is an effector of skin and gut lesions of the acute phase of graft-vs.-host disease. J. Exp. Med. 166: 1280–1289.
. 1987. Tumor necrosis factor/cachectin stimulates peritoneal macrophages, polymorphonuclear neutrophils, and vascular endothelial cells to synthesize and release platelet-activating factor. J. Exp. Med. 166: 1390–1404.
. 1999. Differential roles of IL-1 and TNF-alpha on graft-versus-host disease and graft versus leukemia. J. Clin. Invest. 104: 459–467. Chaudhry, S. I., S. Hooper, E. Nye, P. Williamson, K. Harrington, and E. Sahai. 2013. Autocrine IL-1β-TRAF6 signalling promotes squamous cell carcinoma invasion through paracrine TNFalpha signalling to carcinoma-associated fibroblasts. Oncogene 32: 747–758.
. 2006. The effect of IL-1beta on the expression of inflammatory cytokines and their receptors in human chondrocytes. Life Sci. 79: 764–771.
. 2004. Leukocyte-derived interleukin-1beta interacts with renal interleukin-1 receptor I to promote renal tumor necrosis factor and glomerular injury in murine crescentic glomerulonephritis. Am. J. Pathol. 164: 1967–1977.
. 1995. Interleukin-1 or tumor necrosis factor-alpha antagonists do not inhibit graft-versus-host disease induced across the major histocompatibility barrier in mice. Transplantation 60: 1371–1374.
. 2002. Interleukin-1 blockade does not prevent acute graft-versus-host disease: results of a randomized, double-blind, placebo-controlled trial of interleukin-1 receptor antagonist in allogeneic bone marrow transplantation. Blood 100: 3479–3482.
. 2004. Species-specific recognition of single-stranded RNA via toll-like receptor 7 and 8. Science 303: 1526–1529.
. 2004. Innate antiviral responses by means of TLR7-mediated recognition of single-stranded RNA. Science 303: 1529–1531.
. 2004. Recognition of single-stranded RNA viruses by Toll-like receptor 7. Proc. Natl. Acad. Sci. USA 101: 5598–5603.
. 2003. Toll-like receptor 9-mediated recognition of Herpes simplex virus-2 by plasmacytoid dendritic cells. J. Exp. Med. 198: 513–520.
. 2003. Flexibility of mouse classical and plasmacytoid-derived dendritic cells in directing T helper type 1 and 2 cell development: dependency on antigen dose and differential toll-like receptor ligation. J. Exp. Med. 197: 101–109.
. 2012. Heparan sulfate, an endogenous TLR4 agonist, promotes acute GVHD after allogeneic stem cell transplantation. Blood 120: 2899–2908.
. 1998. Tumor necrosis factor- alpha production to lipopolysaccharide stimulation by donor cells predicts the severity of experimental acute graft-versus-host disease. J. Clin. Invest. 102: 1882–1891.
. 1993. Effect of IgM-enriched intravenous immunoglobulin (Pentaglobin) on endotoxaemia and anti-endotoxin antibodies in bone marrow transplantation. Eur. J. Clin. Invest. 23: 540–545.
. 1990. The gut mucosal barrier in bone marrow transplantation. Bone Marrow Transplant. 5: 373–377.
. 1992. Use of IgM enriched intravenous immunoglobulin (Pentaglobin) in bone marrow transplantation. Bone Marrow Transplant. 9: 451–457.